Oh boy, what a terrible week for gold mining stocks! When it rains it pours, as they so often say. Fortunately, as a buyer, these down weeks provide some of the best opportunities that we have to add to our positions. By no means do I think that the worst is over… In fact, I think that more troubling times are yet to come once tax–loss season commences in December. However, I don’t have a crystal ball so I can just do the best that I can to continue to take advantage of low prices when they emerge. I did mention in the last post that I wanted to start conserving more cash… To make ends meet, what I had to do was dip into my 401K account to fund these purchases. Not ideal, but you’ve got to do what you’ve got to do. As long as I continue to maintain a cash balance of over $100,000 I’m comfortable enough with the risks that I am taking with these kinds of speculations. Like always, I try and do what I say. I mentioned that I thought shares of EXK and IAG were approaching cheap valuations so that when they eclipsed my thresholds, I had to buy and dollar cost average down. Similarly, I did the same with KLDX. As it pertains to GDCRF (my arbitrage opportunity to get into First Mining Finance), I just really admire Keith Neumeyer and the First Mining Finance (FF.V) team’s business model and strongly believe that management will do what it takes to make this company a massive success story. These guys are buying up assets for literally pennies on the dollar (which makes it much harder to screw things up), which is absolutely the most brilliant thing you can do in a bear market. 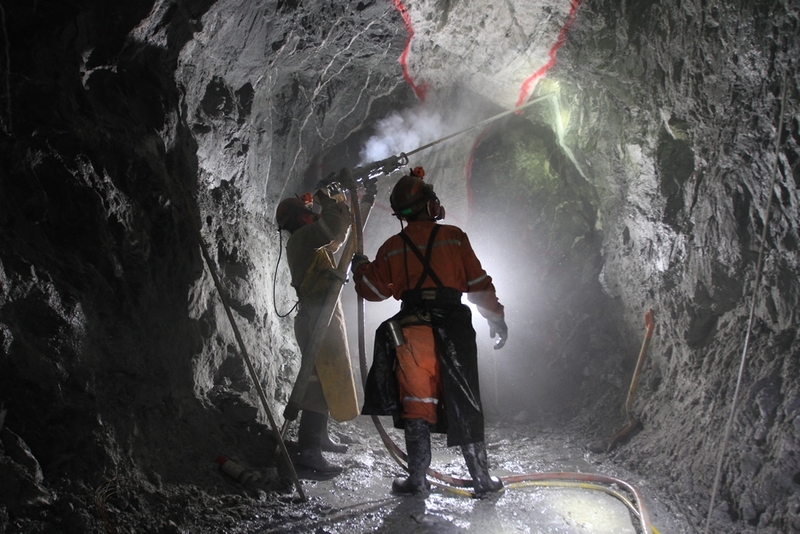 While many majors got burned during the last bull market, such as Barrick Gold (ABX), by paying far too much for goods, First Mining is being aggressive when others are timid and cutting back. In contrast, ABX has a greatly bloated balance sheet and has been selling off assets at the bottom of a cycle… the worst time to do so! In the process, I also liquidated out of my position in Hecla Mining (HL), selling all 1,500 shares @ $2.12/share. HL was never one of my favorite ideas so I booked profits and utilized the funds to help expand my other positions. McEwen Mining is also a company that I probably will not hold for the long haul. I thought prices were cheap so I bought some to trade over the short-term. It sure has been a busy week… But if the market wants to keep punishing gold and gold mining stocks then I will have no choice but to keep buying more! The current valuations are absolutely absurd and to me that is an indisputable fact. 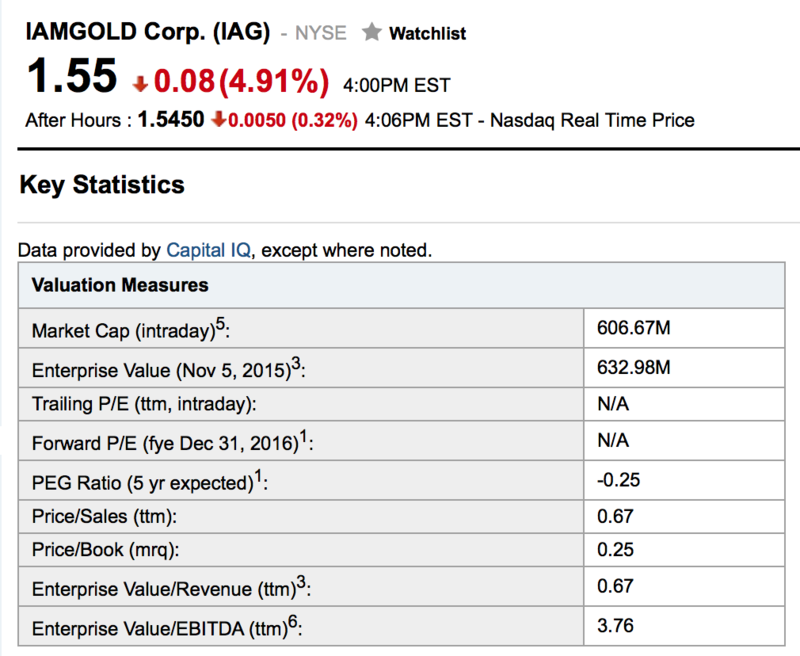 IAMGOLD has it’s share of problems (Westwood Mine accidents, untimely oil hedge contracts, West Africa exposure, etc. ), no doubt. 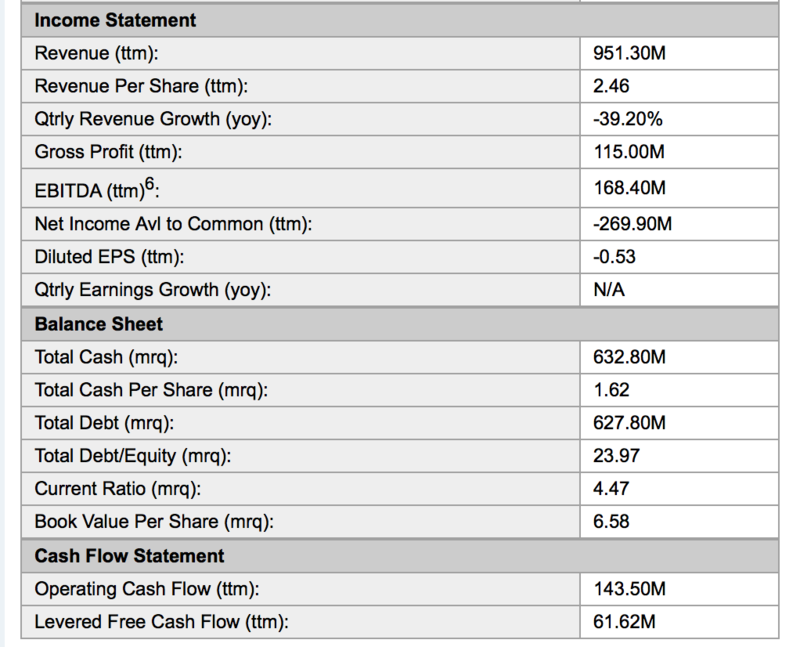 Just like any other mining company… But at ~$1.50/share and below, I’m buying. Like the rest of the lot, IAMGOLD quite frankly just needs the price of gold to turn for its share price to spike higher. Just to be clear, these type of valuations are NOT uncommon in this sector… Teranga Gold (TGZ.TO), Perseus Mining (PRU.TO), Newmarket Gold (NMI.TO), etc. are trading at similar, if not cheaper valuations. Silver, for example, is currently selling for less then the cost of production for many mining companies… like Endeavour Silver. If prices decline much lower, mines will be forced to shut down (which is already happening)! As an investor, you’ve got to love and salivate over that fact… Anytime a commodity (that is needed by the world) trades for at or below the cost of production, you’ve got to start paying attention. The world isn’t going to stop demanding more gold and silver, so I’ve got no worries about demand waning; these investments are commodities for crying out loud, not a speculative new high-tech web start-up company! If anything, demand from emerging nations such as China and India will only increase over time. Supply destruction can only lead to higher prices!!! Quite simply, I am a deep value investor and my philosophy is to buy when we are down in the dumps and no one else is interested in a particular investment. I’m agnostic in that sense — I don’t care if we are talking about: real estate, S&P 500, dividend growth stocks, commodities, etc. If it’s down, out, and absolutely unequivocally hated and despised by the mainstream, I’m all ears. When the tide finally turns, and it is only a question of when not if, I should be well positioned to capitalize on the move back up. Markets are cyclical and when they go up or down they tend to overshoot drastically. History doesn’t rhyme, it only repeats… This has happened over and over and over and over again. At some point in time we will get a reversion back to the mean. Prudent shoppers (and I am by far not the only one doing this) are snatching up bargains that are now trading 80% to 90% off. TGM.V, TGZ.TO, LSG are essentially already at those prices outlined above. AUY would have to fall slightly more. My main concern isn’t that prices will keep dropping, rather, I just hope that I will have enough funds to keep on buying. I have to say I am confused by your strategy, which seems to change with each passing season. I was under the impression you set out on this journey for financial independence. Now it seems like you are just trying to accumulate more. Nothing is wrong with that but I just do not understand. I, myself am sticking with the DGI strategy so reading your posts is hard for me due to the small size of the companies you invest in I have no idea about them. Therefore, these posts seem to offer little for me at this point, despite this I do plan to randomly check back in on your site and see how you are doing. Best of luck on your journey. Yes, the strategy has changed over time… A lot of that has had to do with what’s happened in the markets and my discovery of different investment classes. As always, I will never proclaim to have all the answers… Like everyone else, I’m learning as I go and will make and continue to make mistakes along the way. Yes, the plan all along is early FI… Right now, I have 8 cash flowing rental properties and over $100,000 in cash… It would be a stretch to retire right now, but with a part-time gig, it might be possible and conceivable. With that said, I discovered the world of mining stocks and have been taken back by how cheap stocks are right now… Many seasoned investors in the sector are calling this opportunity “once in a lifetime”… Just compare the HUI/gold price index… it’s at historic lows right now. I’m all about opportunity, and I’m speculating with funds I can afford to lose… But from my own experience, you seldom lose when you are buying quality assets for pennies on the dollar, which is what I’m trying to do here. DGI is a great investment strategy. I love it myself… I’m just holding out for when I can buy those aforementioned large cap blue chips for pennies on the dollar (highly unlikely, but you never know). I am right there with you Fighter, as a deep value investor. I love when commodity prices spend time below the cost of production. I don’t know much about the metals, but I know something about Ag commodities, and acres will be taken out of production next season. Plus countries like Saudi Arabia have had to quit growing their own foodstuffs (in this case wheat), because they are depleting their water supply. Opportunity is out there! As usual, we’re on the same page buddy. I love me a good discount and right now there’s probably not a sector out there that is more despised than the natural resources sector… I actually like uranium and copper quite a bit too, but feel like those commodities will be hit harder by any growth slowdowns or bouts of deflation. Just check out a company like Fission Uranium (FCU.TO) who has made a world-class uranium discovery in the ultra-rich Athabasca Basin only to see its share price get thrashed throughout the year… The world simply doesn’t care right now… but if China is going to launch 100 new nuclear reactors in the future, you had better believe that supply will be constrained… Right now, uranium is selling for less than the cost of production. Precious metals are an exception of course since they are valued as money and a common fear trade investment. That’s why I’m not afraid of loading up on them right now. Why did you go for GDCRF rather than GCU this time? I bought GDCRF in my 401k account so it is traded in the U.S. OTC. My plan admin doesn’t allow for the trading of foreign stocks. GCU is in my foreign exchange account and is traded on the TSX-V in Canadian dollars. In fact, I think that more troubling times are yet to come once tax–loss season commences in December. Mining stocks are down big this year so no doubt institutions and even retail investors will be looking to harvest tax losses at the end of the year. Further, if rates go up, miners will get hit hard yet again. I’m going to hold out until December to see what happens before loading up for more shares. Next post: Are You Contrarian?